I remember my hometown in California before it became the predominantly Korean and Chinese populated area that it is today. I remember bringing the leftovers my mother made to school and the shame I felt when the entire lunch table cleared out at the sight of my Dan Dan noodles. Imagine what I felt 20 years later when an American chef told me that the Dan Dan that he had at Seven Star Pepper was one of the best noodles he’s ever had. Shortly after, Dan Dan noodles made an appearance on the menu of a trendy Sichuan inspired restaurant in Capitol Hill. 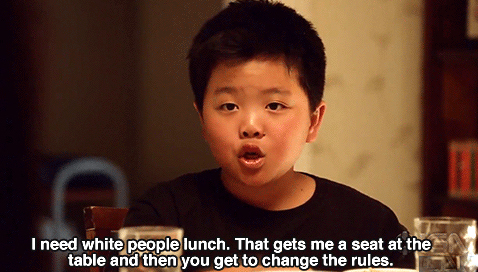 Writer Ruth Tam speaks of a similar experience in her article in the Washington Post, “How it feels when white people shame your culture’s food — then make it trendy” in which she mentions the popular scene from “Fresh Off the Boat” when young protagonist Eddie brings noodles to school for lunch and his classmates mock him, saying his lunch looks like worms. Funny how our humble comfort foods once reviled as “worms” or in Tam’s case, “Chinese grossness,” has become the “best,” “hottest” dish to eat. You’d think I’d feel vindicated, even thrilled, but I remain deflated. I’m less concerned about who is shaming the food or whether the advocates for Asian cuisines are Asian or white, but questioning why it has to be trendy at all in order for our beloved classics to be recognized as one of the greats, alongside the forever popular chicken and waffles or a classic steak. When chefs like Roy Choi and David Chang pushed kimchee and gochujang, or ramen and katsuobushi, forth onto our psyches and gave these terms hashtag status, it not only made it safe and acceptable to consume these items, it made the consumer cool for doing so. We are what we eat. It used to mean that we are the sum of the love of our elders, the hard work of our parents, the challenges we face, and the legacy of the land that feeds us. Today, we are saying something very different about ourselves with the food we’re eating, that we’re high roller enough to dine #MichelinStarStyle, living large with #celebritychefs, VIP enough for #yelpelite, and everyone should be so #jelly because we’ve #omnomnom (The last two hashtags are not real words. You should be ashamed of yourself) on some #foodporn worthy meals. We’ve made our nourishment a status symbol like a new purse, car, or watch. But to say that a dish or cuisine is in trend means that someday, it will be passé. I cannot accept that as a way to view the food I grew up with or a cuisine that has sustained and moved us for generations. As much as I’m grateful to those who advocate for Asian cuisines, I also see a future where the more cuisines we appear to embrace, the more disconnected we are to its source. Don’t call my mother’s food trendy. Don’t make my heritage a fad. Don’t use our cuisines as social leverage. Our cuisines should be sacred. It has been around longer than you and me. It tells the stories of our past, not the whims of the present. I say all this feeling conflicted, knowing that as a professional cook and a marketing person for local restaurants, that trends put butts in seats, but it can just as surely clear a restaurant when a new fad rolls around. As Thai and Filipino cuisine enter the limelight (with restaurants like Pok Pok and local pop ups like Food and Sh*t), and Asian condiments get their 15 minutes in the foodie rags, I too wonder when sambal may have its day as the next gochujang or when soba will be the next ramen. Tiffany Ran cooks at Miyabi 45th and does PR and marketing for select restaurants in town via BlindCock Media.